–unsigned caption to a picture accompanying the interesting interview with Ramona Fradon (a friend of Ward’s) in Alter Ego #69, June 2007. When a statement includes the words “it’s said,” “supposedly,” and “apparently,” it’s doing something less than making a declarative statement of fact. But the gist of the above text is that George Ward often ghosted Pogo on Sundays, and that it may be the case that all Pogo Sundays with the bear were by Ward, not Kelly. I’ve seen this notion expressed before. It originated somewhere, although I can’t say where. Could it possibly be true? If George Ward wrote and drew those strips, he did work that was at least as good as any that Kelly did. In other words, he was one of the greatest cartoonists who ever touched brush to bristol board. Now, here are certainly lots and lots of examples of ghosts doing cartooning as good or better than that of the people who took credit for their work. But if it’s true that Ward was entirely responsible for some of the greatest moments in comics history, it’s an extraordinary revelation. It’s the equivalent of learning that F. Scott Fitzgerald let someone else write The Great Gatsby. So I’m not willing to accept it without lots of definitive proof. And I’d be stunned to learn that such evidence exists. The notion that Kelly did most of the inking on daily Pogo himself but had Ward ink the Sundays is entirely plausible; if it’s true, Ward was a superb inker–maybe as good a brushman as Kelly himself. But nowhere in the interview does Ward say that Kelly had him ghost Pogo. He does say that he left Kelly’s staff in April of 1959; the bear continued to appear, which would seem to be proof that the character wasn’t Ward’s alone. And here’s a question: If George Ward had done some of the best Pogo ever, why on earth didn’t he take over the strip after Kelly’s passing? If he was the guy who did the bear Sundays, and he had taken over the strip in 1973, it would have been by far the best continuation of a great comic strip after its originator’s death. Anyhow, if anyone reading this can prove that George Ward did ghost Pogo Sundays–or that he didn’t–I’d love to hear from you. Absent that, informed speculation would also be appreciated. I know it’s really a place in Massawhatsit, but I always associate the name “Barnstable” with Kurt Vonnegut. 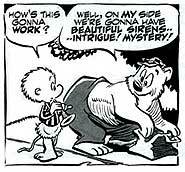 And for reasons I’m not sure of, I file Kurt and Walt Kelly in the same part of my brain. Maybe this ‘bears’ looking into. Wally Wood could certainly draw a good Pogo strip, though it’s possible to tell by looking that the effects were achieved by more painstaking means than Kelly’s. Walt could toss the stuff off, and Wally had to work to duplicate it — but I still think Wally’s work was damn good, and if he was drawing Pogo all the time, I expect it would have gotten easier for him. I have 2 western type cartoon drawings signed by Ward. be worth something. They are dated 1960. Thanks for your help. I have a non-Pogo-related Ward cartoon that certainly bears out his drawing and brush skills, as well as ways in which is both like and unlike Kelly. However, to assert that the Sundays are better than the dailies is almost like asserting that the comic books were better than the developed strip. The depth of content, both written and drawn, in the dailies, esp. 1953-1958, consistently outpaces the Sundays. I also have a George Ward cartoon circa 1979 given by Ward to my father Joseph Marr, who worked for newsweek magazine at the time. I never knew who the cartoonist was til I read this thread this morning and his relationship with Walt Kelly and Pogo. My father was dying of cancer at the time and the note at the bottom which Ward had signed by my father’s staff reads “Love ya Joe, George Ward”. I have it hanging in my living room. It’d done in ink. In the artwork above..the top Pogo is not George (Bud)but the lower is, for sure…I am a 1st Cousin once removed from George and have several examples of his early work, which is distinctive from Kelly’s, He drew much less hair on Pogo. Also the autograph at the top is not Ward’s. but the signature, with the heart is most certainly his, note the difference in the “G” with the Ward signature. Many of his Sunday Pogo’s had this distinctive G in the Pogo title, looks almost like a 6. If you have any of those they were George’s. My father used to read Pogo every Sunday and I would always ask “Is that Uncle Bud’s?”. For many years he would cut out George’s work. The bear you refer to is George’s. It was actually patterned after a housekeeper my Grandmother had whose name was Mildred. “Bud” always said she was big as a bear but gentle as a lamb. I have an original 1945 Poster that he did for my father (his 1st cousin) depicting his return to US from WWII. Would love to know what it is worth, can’t imagine. I also have several illustrations he did for his Aunt Mary (my grandmother). I remember, who we called Uncle Bud, well..he was a fun, very intelligent, and loving man. And yes, I agree….probably the best cartoonist ever. I remember George Ward as my cartoonist neighbor in the 1950’s. His wife was friends with my mother their entire adult lives after they met. George was so energetic and funny! I was just an elementary school kid, and he gave me a Pogo cartoon book…which I will dig up. I know I still have it. He also frequented my father’s diner in suburbia for years. He definitely had a talent and was some influence on my own art to a degree as well. Fun to remember the old days. I worked with George at Newsweek Magazine in the late 70s. He was a photo retoucher on the international edition. I was working part time with him once a week for about 5 months. He was quite a character. He called everyone ‘vet’ and was always introducing me to every one he saw. We went out to eat every night and made sure he introduced me to all the pretty waitresses. He told me that he had every intention of continuing Pogo after Kelly died but Kelly’s wife said the strip had to end with his death. He seemed pretty bitter about it. I was surprised to see the family let the strip continue years later after all. i have tons of these books and have just now started listing some….i had no idea what a fabulous collection they were….i purchased a box full at an estate sale and have lots of duplicates….they are so fun to read!!! I worked in the Newsweek art department for 20 years and if it wasn’t for the presence of George, it would have been a slightly less crazy place. I remember him telling me about his work with Kelly and as you needed any proof, he would whip up a Pogo character on the spot. Walking around the office with his tie flung over his shoulder, a cigar in one hand and food in the other (“Hey vet, you want a bite”! ), he was a wonder to be around. He was always pressed into service ( he didn’t need any prodding) to provide a cartoon for any event. I have one for my marriage. Of course the face of my wife Linda is great, but somehow her body wound up belonging to Betty Page. There will never be another George Ward. When George brought it back he looked at it and told George, “I’ve changed my mind — I’m not going to use this.” Kelly was a perfectionist and he wasn’t totally happy with the results. For one thing, George had no animation background. I first met George at one of Phil Seuling’s New York comic art conventions in the late 1960’s. We became friends as we both shared a passion for collecting original art. 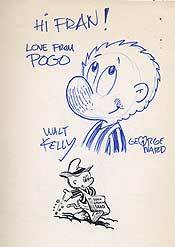 He always had some “Pogo” Sunday page original art available for trade, and I’ve always firmly believed he was Walt Kelly’s main assistant’s. I still have a wonderful watercolor of Pogo and Albert he sent me in 1978 with the matching cardboard he used to pack the art which has really nice original art incorporated into the address. Some years later I ran into Walt’s widow Selby Kelly and asked her why George didn’t take over Pogo when Walt passed away. She confided that …..(ready ?) George was “Putting the moves” on her at Walt’s funeral. Yes, George Did love to look at the women whenever we were together. George, like all of us, wasn’t perfect but he was a great friend with a wonderful sense of humor. I do miss him.